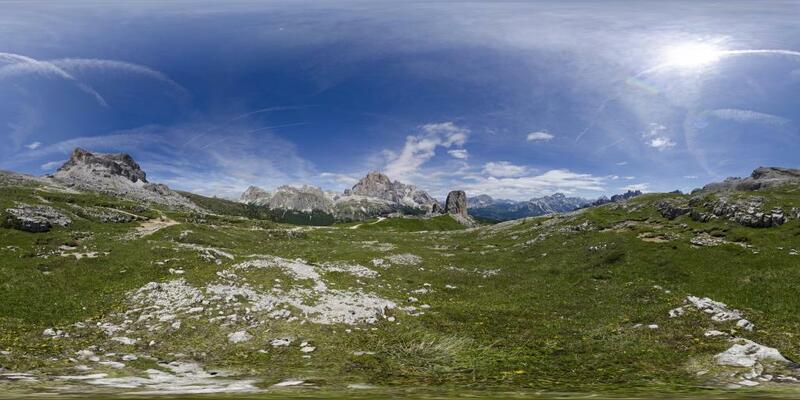 In the Ampezzo Dolomites are the "Cinque Torri" (5 Towers), a small mountain range consisting of dolomite rock. Climbers and mountaineers like the 5 Towers because of the wide choice of routes with different difficulties. Hikers find around the 5 towers wonderful trails with a fabulous view of the eastern Dolomites. View towards north-west: Tofana di Rozes (3,225 m). On the left side of the 5 towers you see the refuge Squirrels, which can be reached by chairlift. View towards the south: Monte Nuvolau. In the south-west is the Mount Averau, the highest summit of the Nuvolau group.